As you all know, Doris loves the sights and sounds of Christmas. She was thrilled with last year's First Edition DDAF Christmas ornament -- and even more excited when proceeds from its sale were so fantastic, allowing us to help so many animals in need. Your response was so encouraging that we're doing it again! 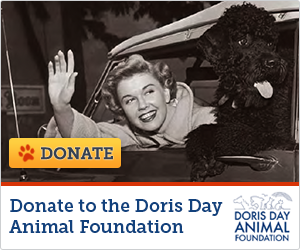 This year's DDAF ornament features one of our favorite vintage photos of Doris, all dolled up for the holidays. It's sure to spark the holiday spirit in any Doris Day fan! Click here to order the new 2016 ornament. And in case you hadn't purchased last year's First Edition ornament, we're making a special offer: Get the First Edition ornament, and this year's, too, for only $35! Click here to take advantage of this two-ornament offer. We know this season is the busiest time of year for many of you. So take this opportunity to check a few holiday gifts off your list at the DDAF online store. All profits benefit DDAF and the 4-leggers!